The Lindarets x Wolf Tooth RoadLink allows the use of wide-range cassettes with Shimano ten- and eleven-speed road drivetrains. Born from our love of two-wheeled adventure, the RoadLink re-locates Shimano road rear derailleurs to allow their use with up to 40t top cogs. This capability is ideal for riders looking to convert their road, gravel, cyclocross, or commuter bike to the simplicity and light weight of a single chainring- or for those whose riding demands lower gearing than a typical double can provide. The 16g RoadLink installs in moments with little more than a 5mm Allen wrench. 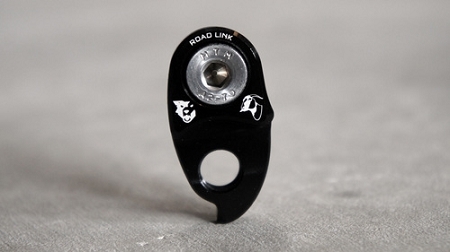 The RoadLink is CNC machined from 6061 aluminum, anodized, and laser etched at Wolf Tooth Components’ Minneapolis facility. Each comes fitted with our proven stainless steel hardware.